To start with, let’s make one thing very clear. I love maps. I always have. When I was a child the books I treasured most were Atlases. I can happily waste large chunks of a day zooming in and out of Google Maps and trying to spot things that I didn’t before. Their ability to be simultaneously both scientific and artistic, to both reveal and conceal, and both inform and deceive, has always fascinated me. As has the power of a map to shape the way people see the world and the way they live their lives. So, if you’re looking for a review of the London Transport Museum’s exhibition Mind the Map: Inspiring Art, Design & Cartography that is truly objective and written by a non-map-lover – indeed, by someone who feels entirely neutral about maps – then you should probably stop reading. Telling the story of London’s transport maps and how they have been inspired by, and in turn inspired, art and wider society, this exhibition was right up my street. I was transfixed from the very first picture. The evolution of the tube map, design icon that it undoubtedly is, dominates the exhibition, but there are plenty of surprises too, including Jeremy Wood’s fascinating ‘GPS drawing’ charting his every move through London, some delightful London Transport posters depicting the paradise to be found in the new suburbs, and a series of crude sketches of the tube map drawn by members of the public from memory. 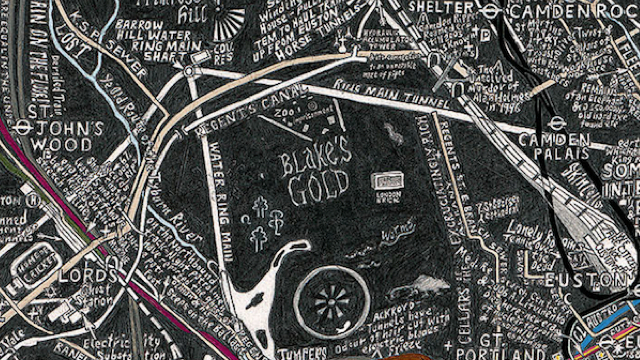 Stephen Walter’s London Subterranea, a hand-drawn map of central London jam-packed with place names, facts and figures, anecdotes, myths and legends relating to the places, is one of the highlights. His 2008 work The Island, that depicted the whole of Greater London and its surrounding “seas”, was in the same style but its focus was more general. Walter’s latest work focuses on London beneath the surface, literally and also, perhaps, metaphorically. Lines that at first look like familiar main roads are, when one peers deeper, revealed to be sewers. Other less familiar lines turn out to be all manner of tunnels, used and disused, snaking their way past underground rivers, a post office tube line, cold war bunkers, and abandoned tube stations. Walters seems particularly interested in the macabre side of London, marking the sites of various famous murders with skull-and-crossbones, and showing the sites of the great many plague pits that lie beneath Londoners’ feet. Like The Island, which I saw at an exhibiton at the British Library, London Subterranea is so staggeringly detailed that it can be gawped at for, well, ages. I defy anyone to take just a couple of minutes to look at it and move on. Equally enchanting are playful, cartoon-like maps of London from the early twentieth century by artist Max Gill. As some of his also-displayed premilimary sketches show, Gill would begin with a geographically accurate birdseye street plan and then draw on the buildings in rich detail and lavish colour, exageratting the size of the city’s famous landmarks, and then populating the streets and parks with people working and playing. Other more surreal details would also be added, such as on the Wonderground map of London, a giant serpent in Hyde Park, its arched body forming the curve of the Serpentine lake. The children playing cricket, the comic-book speech bubbles and the slightly medieval-Gothic look to the map’s decoration all contribute to a rather innocent, whimsical feel but even Gill, like Walter, is still captivated by the dark side of London’s history, and throws in a condemned man hanging from the scaffold at Tyburn (explore a high-res version of Gill’s Wonderground here). The whole upper floor of the exhibition is devoted to the London Underground map, charting its evolution from the pocket paps of the Victorian era, through Harry Beck’s famous re-design based on electrical schematic diagram, and into the strange world of tube-map-inspired art. Within this world is the alternative-tube-map strand, which seems to have begun around 1992 when Simon Patterson replaced the names of stations and replaced them with politicians, musicians and saints (The Great Bear, see below). In his updated version of this work, called Saptarishi, he adds a topical feel in the shape of a ‘line’ of bankers and of Murdochs. Even the simple pocket tube map seems to have taken on a life on its own over the years. 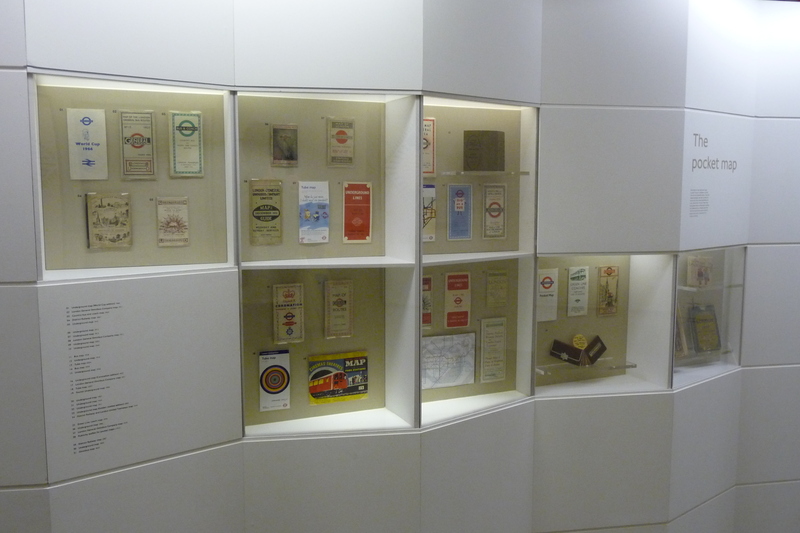 On display are some wonderful examples from throughout the London Underground’s history, including special editions made to commemorate important events (such as the Golden Jubilee of Queen Victoria in 1887, the Festival of Britain in 1951 and the 1966 World Cup). Alongside are some early examples of pocket-sized bus, tram and street maps of the capital. The oldest was a delightful walking map of central London from the 1840s! There is also a section focusing on three recent incarnations of the pocket tube map, or more specifically, the ‘cover art’ that adorns them, and features video interviews with each of the artists discussing their work, including Tracy Emin whose work is – at the time of writing – on the cover of the current pocket tube map. Map-lover that I am, I found this exhibition not only enthralling but strangely reassuring, for it seems that I’m not the only one who sees maps as far, far more than mundane, functional items! 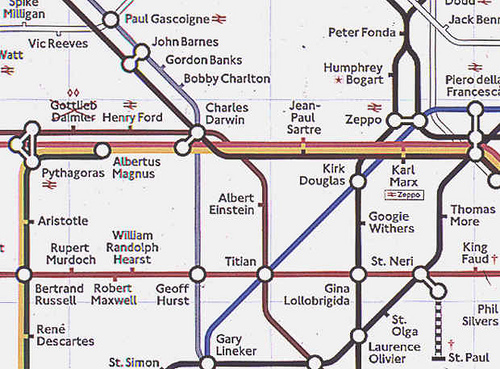 Seeing how many artists have had their imaginations fired by the tube map, how the designers who came before them constantly strived the improve and perfect Beck’s masterpiece, and how Beck himself grappled with the challenge of illustrating London’s underground in a simple, elegant manor, was nothing short of inspiring. Mind the Map is at the London Transport Museum in Covent Garden until the 28th October. There is no charge for the exhibition itself but entry to the museum is £13.50 (concessions £10). You can go back to the museum as many times as you like for a whole year once you have a ticket, which I’ll certainly be doing once the school holidays are over since I want to get on board on of those old buses they have when there’s a few less children around. Tags: cartography, Design, exhibition reviews london, exhibitions london, Google Maps, Harry Beck, Jeremy Wood, London, London Transport Museum, London Underground, Maps, Max Gill, Mind the Map, Mind the Map review, Queen Victoria, Simon Patterson, Stephen Walter, Tracey Emin, tube map, Victorian. Bookmark the permalink. Funny – I have a love hate relationship with maps! I love to travel, so they are a necessary evil to me, as I struggle to read them! Currently touring around Rome, and the transit maps are making me crazy! But, like I said, I love to travel – they are a crucial part of getting around! As for atlases – I think they are more dreams than maps. I love going through my atlas and daydreaming of where to go next! Love maps for that! Wish I could go to London to Check out the LTM in October. From one map lover to another, thank you for covering this exhibit. i love maps, too! in fact, my home office is wallpapered with various city maps ranging from subway, bike lane, old world, etc! I visited the London Transport Museum more than ten years ago. It is one of the most interesting museums I have been to. The exhibits on the Tube and the Bus system were really cool. Next time I am in London I will have to visit again. Thanks for the great post. This is what I always loved about cartography and GIS. Part science, part art, and a little bit of everything else mixed in so you never have the same day twice! Very interesting. I love maps too. I find them fascinating, I can literally stare at a map for hours, discovering every single corner it has. By the way, I absolutely fell in love with your little definition of what a ‘exhibitionologist’ is. It’s a really clever and cute idea for a header. Maps Are something special and give insights to the areas around us that we may never get in person, I used study the AtoZ of London looking at street names and also for industrial places in London and I often went to the local library who keep extensive old maps in the reference department, Although my interest has been over looked as I have got older I do still collect maps I have a few pre 1950 tube maps and I was also able to get hold of a A0 tube map with no river and no zones which was only on display for about a month and its still in its original tube. I thank you for bringing this old hobby of mine back to the present I am going to make more of an effort to get back into it. Glad to see that someone else liked this exhibition too! I blogged about this sometime ago. I found it interesting, as maps can be so artistic. Congrats on being freshly pressed! I just learned that I love maps! Thanks! My husband and I collect maps of Boston, MA where we live. We can’t afford originals, but we have some very good reproductions. One of my favorite maps is one drawn by a British Army Lt. of the rebel fortifications during the revolution. We live near a fort that was an American stronghold and you can see it on the map. We also have a great old Boston subway map. Thanks for posting this. Sorry we won’t get to London to see the exhibit. I love maps. And i depend on maps, google maps specially every time i have to visit somewhere distant. In fact i used to play many games with maps in childhood…. I have the same affliction… spending a lot of time looking at maps! I love it. Thanks for sharing.